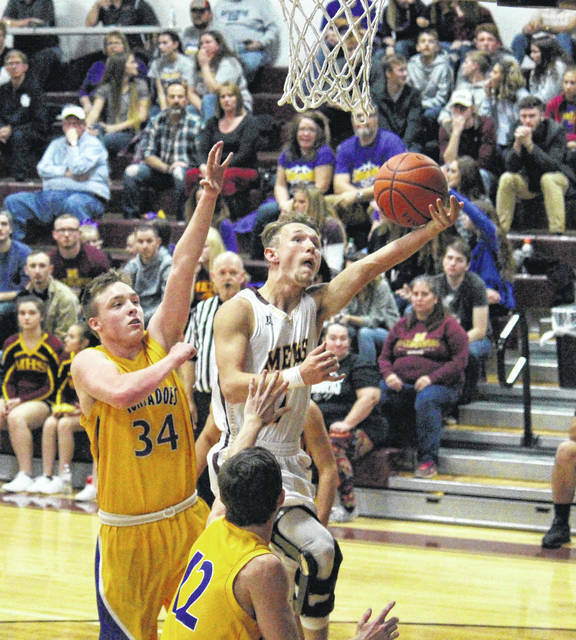 Southern junior Austin Baker (center) goes in for a layup in front of MHS junior Zach Bartrum (15) during the the Tornadoes’ 76-68 victory on Saturday in Rocksprings, Ohio. Meigs senior Christian Mattox attempts a layup in front of Southern sophomore Austin Vancooney (34), during the first half of the Tornadoes” 76-68 victory on Saturday in Rocksprings, Ohio. ROCKSPRINGS, Ohio — The Tornadoes were certainly ready to get the 2017-18 season started. 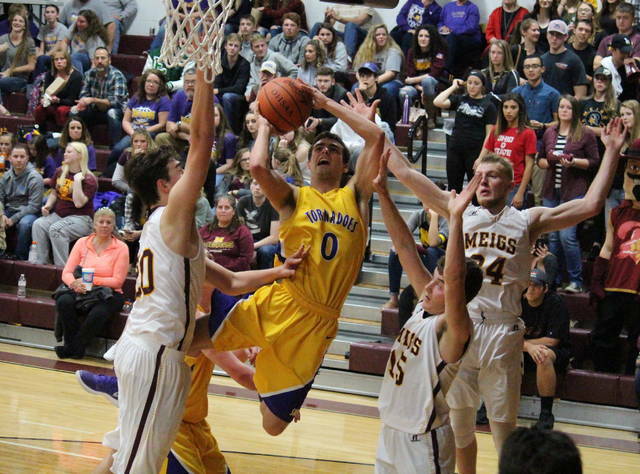 In its season opener, the Southern boys basketball team shot over 40 percent from the field and from beyond the arc on Saturday night inside Larry R. Morrison Gymnasium, as the Tornadoes claimed a 76-68 victory over non-conference host Meigs. After trailing 2-0, Southern (1-0) answered with an 8-1 run, but the Marauders (0-2) answered with a six straight points and took the the lead back with 3:08 left in the first quarter. The Purple and Gold regained the lead just 16 seconds later and never trailed again. Meigs tied the game at 11, 13 and 16, but Southern closed the first quarter with back-to-back trifectas and took a 22-16 advantage into the second. The Marauders cut the deficit as low as one in the second quarter, but Southern hit five three-pointers in the stanza and headed into the half with a 43-34 lead. After the break, Meigs began chipping away at the Tornado lead, taking it as low as three points, at 54-51 with 1:30 left in the third. Southern’s lead back to four points, at 57-53, by the end of the third period. The Tornadoes began the finale with a 19-8 run, pushing their advantage to 76-61 with 1:14 to play. In that stretch, Southern was 10-of-13 from the free throw line and pulled in offensive rebounds on two of the three misses. Meigs finished the game with a 7-0 run, but it was too little, too late, as SHS took the 76-68 win. For the game, the Tornadoes were 24-of-55 (43.6 percent) from the field, including 12-of-27 (44.4 percent) from three-point range. Meanwhile, Meigs shot 26-of-68 (38.2 percent) from the field, including 10-of-14 (71.4 percent) from beyond the arc. The Maroon and Gold were 10-of-14 (71.4 percent) from the free throw line, while the Purple and Gold were 16-of-30 (53.3 percent) from the stripe, after missing their final seven tries. After being outrebounded by three in the first half, the Tornadoes wound up winning the rebounding battle by a 35-33 count for the game. However, Meigs earned a 14-to-10 advantage in offensive rebounds. 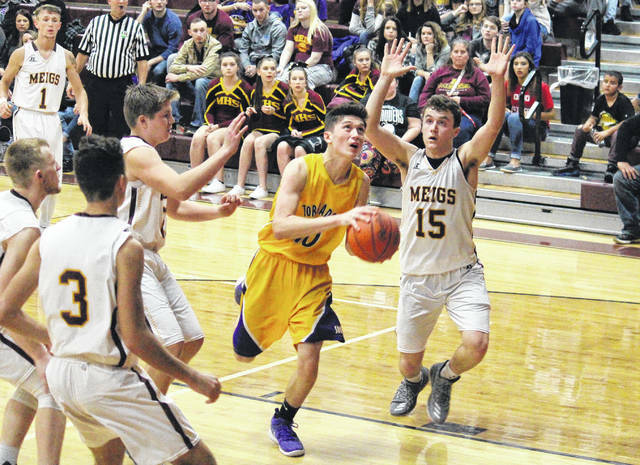 Meigs also won the turnover battle by a 18-to-12 clip, forcing seven over the final eight minutes. The Marauders earned a 9-6 edge in steals and rejected three shots. The Tornadoes finished with 20 assists as a team, while the hosts combined for 17. Southern was led by junior Weston Thorla, who posted team-highs of 19 points, seven assists and four steals. Jensen Anderson finished with 15 points for the guests, Brayden Cunningham and Dylan Smith both recorded 10 points, while Coltin Parker added nine. SHS junior Austin Baker contributed seven points and a team-high eight rebounds to the winning cause, Austin Vancooney chipped in with four points, while Trey McNickle came up with two points and seven rebounds. The Marauders were led by senior Christian Mattox, who had team-bests of 31 points and four steals in the contest. Weston Baer scored 16 points and grabbed six rebounds for the hosts, Cooper Darst recorded 10 points, while Zach Bartrum was responsible for six points and team-highs of eight rebounds and nine assists. 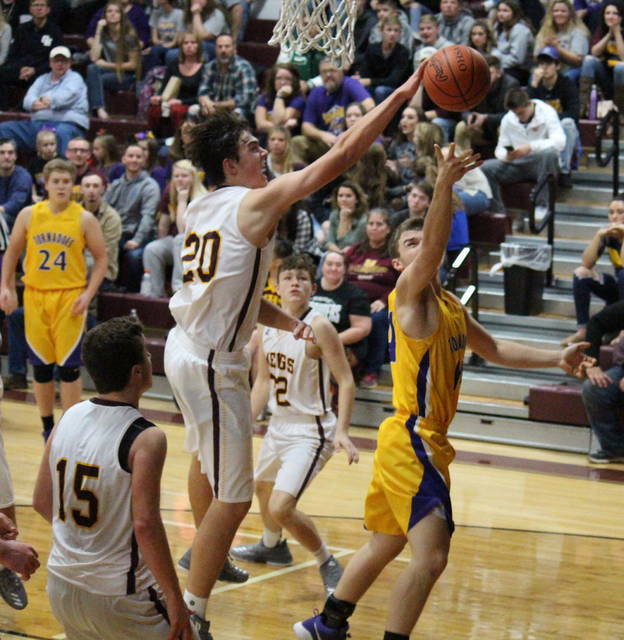 MHS junior Nick Lilly had three points for the Maroon and Gold, while Bobby Musser had two points, six rebounds and a game-best two rejections. This is the lone meeting between these Meigs County foes this season. Southern begins Tri-Valley Conference Hocking Division play next, as South Gallia visits Racine on Friday. Meigs will continue non-league play on Tuesday at Gallia Academy.